Thundering over the Don Valley on a westbound subway train it's easy to underestimate the shining river below. In numerous locations - Bloor, Gerrard, Dundas, Queen, Eastern, and the Gardiner - it's possible to entirely skip over the lower Don without so much as a bump in the road. Man one, nature nothing. It wasn't always that simple. Scattered throughout the valley are several abandoned, seldom used, and vacant spaces left by demolished former bridges that once crossed the Don at the river bank rather than the valley wall. 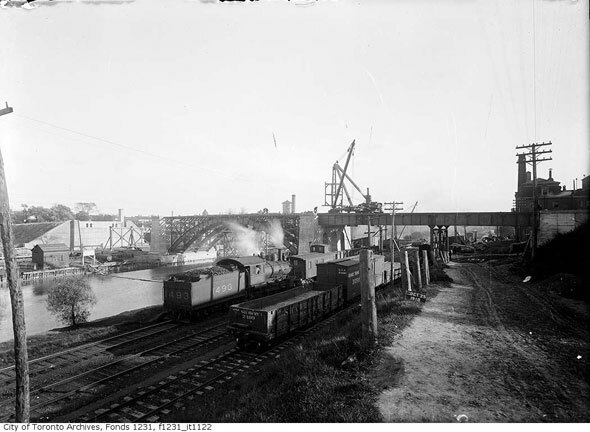 Almost every major crossing point south of the Evergreen Brick Works is on its second or third bridge, with the old structures torn down in favour of greater strength, width and height. 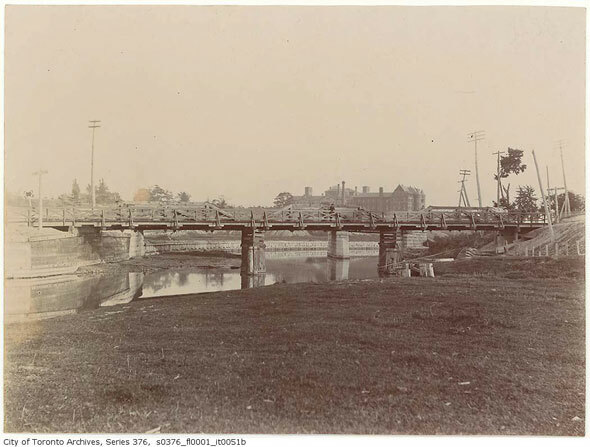 The first crossings over the lower Don River, once a powerful, meandering waterway prior to a major engineering project in the late 1800s, were probably nothing more than logs lashed together over a narrow part of the water, much like Playter's Bridge, (shown above, and drawn by Elizabeth P. Simcoe, the wife of John Graves Simcoe). 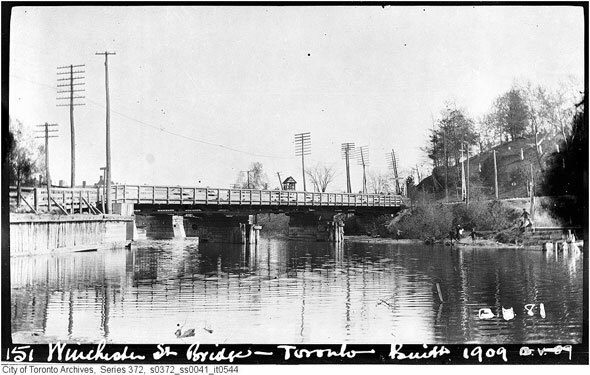 Playter's Bridge was located parallel to Winchester Street in today's Cabbagetown - a road that once continued down into the Don valley past Necropolis Cemetery. The same crossing point would later be home to the first major bridge over the Don, the larger Winchester Street bridge, shown below with The Isolation Hospital - a precursor to Bridgepoint Health - in the background. The Riverdale Park pedestrian bridge stands just south of the old Winchester Street crossing, which is now, sadly, gone. Heading south, the Gerrard Street bridge is the next crossing point. The bridge presently transferring traffic between Broadview Avenue and River Street is actually the third structure to stand on the site. The first, known as Bell's Bridge, was washed away by a flood in the late 1800s, but the second was rather more substantial. Traversing the entire Don Valley and the railway corridor on the west bank, the metal and stone bridge was a significant upgrade from its predecessor. But, like many other bridges, it became an obstruction as river traffic increased. The third Gerrard Street bridge, the one in use today, features steel arches tall enough for highway, railway and river traffic to pass underneath. The wider road deck has enough room for four lanes of traffic - two in each direction - and two streetcar lanes. It's a similar deal over at the Dundas Street bridge, which is in its second incarnation. Dundas Street itself is actually a relatively new addition, frankensteined together from numerous east-west streets. At the time of its construction, the bridge connected Elliot Street in the east, with Wilton Street in the west. Fortunately the road deck was built high enough for the Don Valley Parkway to pass underneath. Continuing south, the next major crossing point is the Queen Street Viaduct. There have been at least three bridges at this location since the 1800s. The first captured on film is a low-slung, girder bridge that hopped the river until 1911. It's likely the bridge was replaced for several reasons: to prevent damage from ice break-up on the river below, allow river traffic to pass underneath, and allow increased traffic over the top. 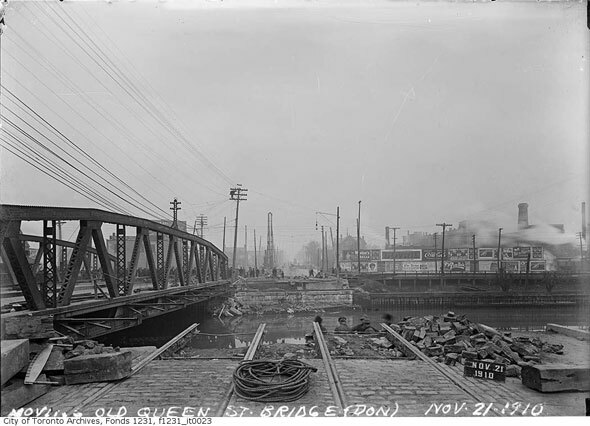 When it came time to replace the bridge with the green truss we know and love today, the old bridge was left in situ while workers hammered away on the ramps and new intersection of King and Queen to the south. The Queen Street Viaduct, to use its official name, was renovated in the 1990s and the famous clock and quote added in 1996. The clock stopped working and was stripped out in 2010. 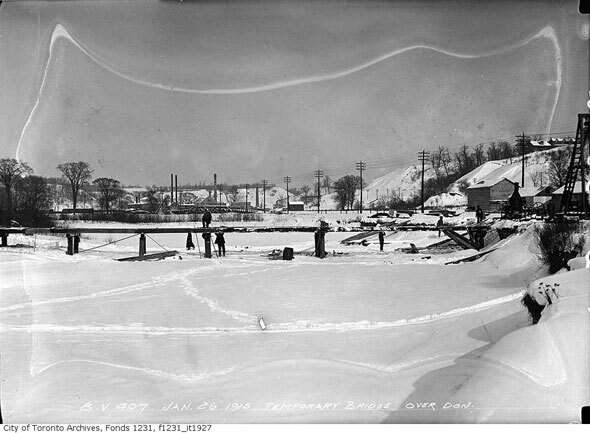 The flow of ice down the Don caused the destruction of several early bridges and was one the key components of the "Don problem," a list of gripes and obstacles to industry that led to the dredging, straightening, and general taming of the river south of Gerrard Street. The original Eastern Avenue bridge, now considerably further south than the street it used to carry, was one such structure to be claimed by the raging river. The rusting truss bridge still standing today, cut off by the highway on one end and the Lower Don Recreation Trail at the other, once met Sunlight Park Road, formerly part of Eastern Avenue. At some point the Eastern Avenue truss was doubled in width; early photos show it at just half its original size. The concrete arch bridge beside it is actually still functional; it carries a major Enbridge gas main over the river. Because it's cheaper to maintain than demolish, the old Eastern Avenue bridge remains stranded in place. South of here, the Don is traversed by several box girder highway ramps connecting the Gardiner and Don Valley Parkway. The Gardiner itself passes over the river just before the waterway makes a sharp right-angle turn - necessitated by an old land dispute - into Ashbridges Bay. 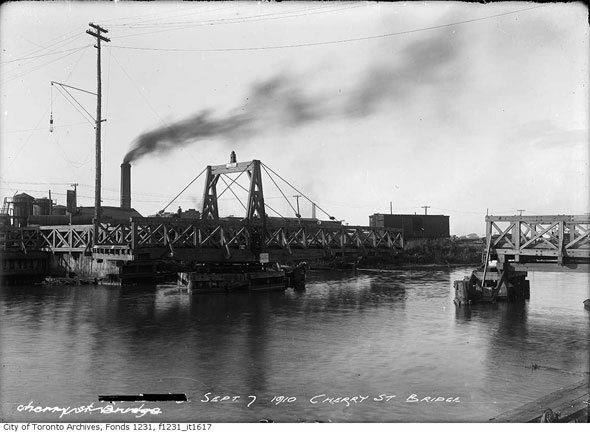 The most southerly crossing point of note is the famous Cherry Street lift bridge. Built in 1968, the pivoting structure allows lake vessels to access the Keating Channel and the port area off Villiers Street. The bridge replaced a basic wooden swing structure which, amazingly judging by its rickety appearance, carried a single train track over the channel. 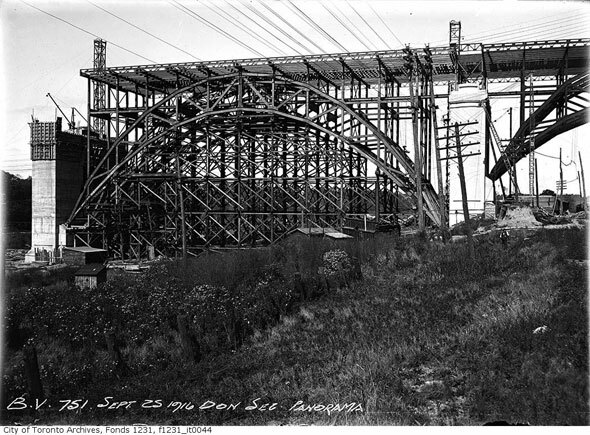 Of course, no tour of bridges in the lower Don Valley would be complete with out the big daddy: the Prince Edward Viaduct between Bloor Street and Danforth Avenue. The complete viaduct system is actually two bridges and a large embankment at the top of Parliament Street, built together in 1912. 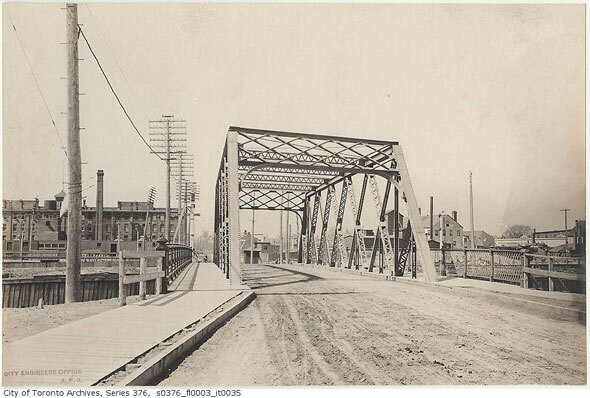 The western phase created a connection between Bloor and Parliament Streets north of Howard Street while the smaller western section of bridge traversed the Rosedale Valley. 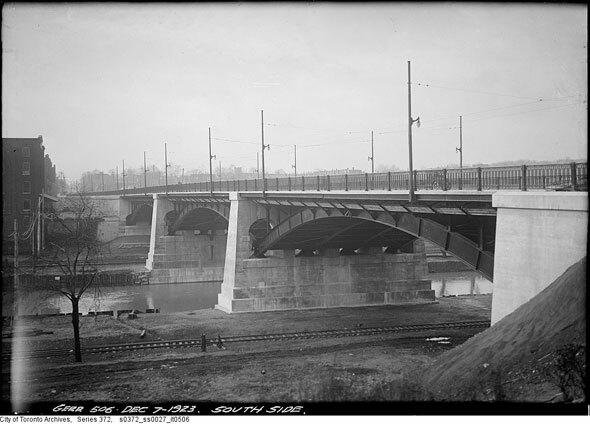 The largest piece, the stunning three hinged concrete-steel arch bridge over the Don, was finished in 1918 and named after the Prince of Wales, later Edward VIII. Showing remarkable foresight, both bridges in the viaduct were built to accommodate a subway that wouldn't arrive for decades. Thanks to the roughed-in train deck, only minor modifications were needed when the Bloor-Danforth line arrived in the 1960s. 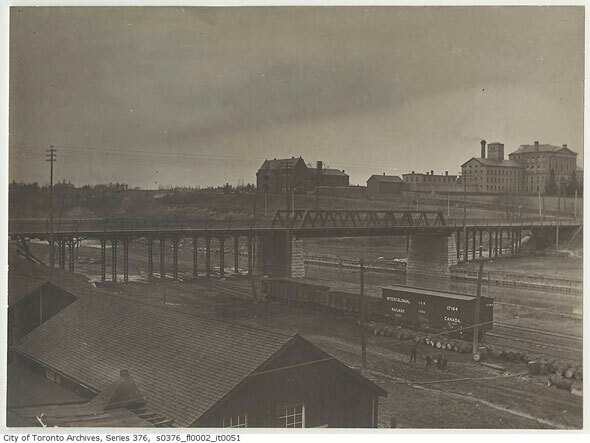 The bridge over the Rosedale Valley is also capable of carrying subway tracks, but the curve to Sherbourne station was considered too tight, necessitating the separate, covered bridge out of Castle Frank. The suicide prevention barrier, dubbed the luminous veil, arrived in 2003 to reduce the alarming number of people jumping to their deaths over the low railings. At one time, an average of one person jumped every 22 days. Several rail bridges also cross the Don throughout its lower reaches. The most impressive is the mostly disused CPR "Half Mile" bridge near the Evergreen Brick Works. Soaring above the valley floor, the structure - actually less than half a mile long - was built in the 1880s to ease trains up a change in elevation. It was renovated in spectacular fashion in the 1920s to safely support more weight. In daredevil fashion, workers built a new bridge beside the old one and slipped replacement pieces into position between trains without ever interrupting service. Can't say I would like to be on the first train over a hastily installed section of bridge, but it was a different time. Several smaller steel and stone bridges are visible from the Lower Don Recreation Trail, which is perhaps the best way of viewing the current crop of Don bridges first-hand. I heartily recommend a trip while the weather holds up. A later incarnation of the Winchester Street after renovations in 1909. The newly completed Gerrard Street bridge. A makeshift bridge over a frozen Don River. The old Queen Street bridge is shifted to make way for its replacement. Photos: Toronto Public Library and City of Toronto Archives.